Born in Finland, Maija Grotell studied in Helsinki at the Central School of Arts and Crafts with Belgian-English ceramist Alfred William Finch. After immigrating to the United States in 1927, she taught at the Henry Street Settlement, Rutgers University, and several other institutions in the New York City area until 1938, when she was invited to join the faculty at Cranbrook Academy of Art. 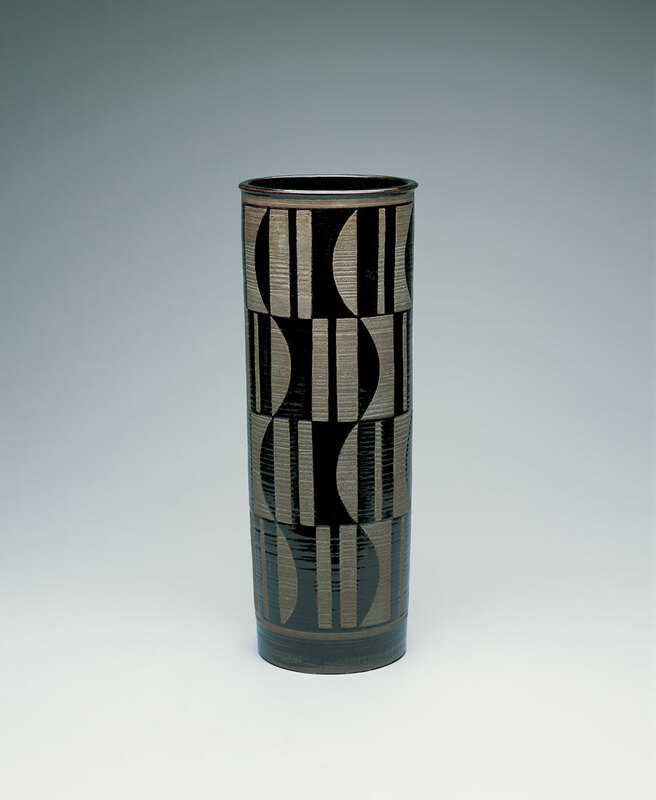 The strong, simple silhouette of this vessel is characteristic of Grotell’s production throughout her career. To decorate the cylinder, she used slip—a form of clay thinned to a creamy consistency and painted on before firing; the blackness of the Albany slip contrasts with the lighter clay body. Grotell applied it in a geometric pattern, allowing the opposition of positive and negative spaces to establish a contrapuntal rhythm across the surface. By the later 1940s, Grotell’s experiments would lead her to combine the same Albany slip with a Bristol glaze to create vessels with a pocked surface in which dark and light areas bubbled together like lava.